Let’s face it: we all have a few guilty pleasure movies that we hold dear and watch whenever no one’s around. These are the very best (or worst) of the bunch, the most terrible movies we hate to love—and why we love them so much despite how awful they are. Duh. Sharknado took bad movies to a whole new level, and in case you don’t believe that everyone else is secretly loving and watching these horrifying movies, just remember this: since 2013 Sharknado has spawned an entire horrible series. Sharknado 2: The Second One, Sharknado 3: Oh Hell No!, Sharknado, the 4th Awakens, Sharknado, Heart of Sharkness, Archie vs. Sharknado, Sharknado: The Video Game, and How to Survive a Sharknado and Other Unnatural Disasters are all the heinous offspring of Sharknado. In this Britney Spears drama—which pretty much says it all—three unlikely friends go on a road trip that changes their lives and allows them to sing karaoke. Wow! You can’t top that. This is the first Nicolas Cage entry on this list, but it sure isn’t the last. In the National Treasure series, Cage is on an archaeological treasure hunt that seems designed primarily to allow him to deliver such bon mots as “we need to kidnap the president,” and “we need to steal the Declaration of Independence.” Better still, he follows through on his brilliant plans. Obviously when dramatic heavy hitters like Patrick Swayze and Keanu Reeves team up, you know cinematic sparks will fly. In this classic tale of undercover FBI surfing, we follow the adventures of agent Johnny Utah as he chases down dangerous wave riding bank robbers along the California coast. Bitchin. We should preface this by saying that we love Ice Cube, yet there’s something totally amazing about seeing even Ice Cube level badassery taken down by a gigantic fake puppet anaconda. Yes, in this movie we see a phony documentary crew which includes Eric Stoltz and J Lo stalked by a mammoth snake, but its best feature is Jon Voight’s astonishingly ridiculous accent. If you’re anything like us, you’d put yourself in harm’s way just to be saved by FBI agent Samuel L. Jackson, especially when he’s at his hilarious best. So yeah, we’d brave Snakes on a Plane if it meant the exciting Agent Jackson in-flight conclusion. An unreasonably large portion of this movie is taken up by Ben Affleck and J Lo arguing about whether or not they should cut a guy’s thumb off. That sounds really dull, but actually it proves to be the high point of the film. The first Saw movie was pretty good, but each installment in this franchise after part one was kind of like the blood and guts equivalent of professional eaters competing. Instead of seeing some skinny dude sucking down hundreds of hotdogs in three minutes followed by increasingly awful feats of gastronomic excess, you sit through more and more sadistic torture scenes without any real plot thread. Naturally, you stick with it, though, because you get hooked like your grandma did on General Hospital. This is one of the finest examples of Nicolas Cage using his mysterious innate force to make you watch him act out a truly awful script. For a good time, call Nic and watch him freak out on a tiny island as he searches for a missing girl. What if we told you that LucasFilms and Marvel Comics would together create one of the worst films of all time? If you were there in 1986, you already know: it happened. This movie is terrifying in every way, and while it’s difficult to choose a low point, the love scene between the anthropomorphic duck, Leah Thompson, and her huge head of crimped 80s hair is right up there in the running. Face/Off is one of those movies that has a premise that’s just too stupid to produce anything but a truly awful movie. First of all, in this film John Travolta is the lawman who doggedly tracks the bad guy for years of his life. Second, that bad guy is Nicolas Cage, an evil mastermind. Third, Agent Travolta somehow realizes that the only way he can catch the supervillain is to get plastic surgery so that his face looks identical to that of his nemesis. Makes sense, right? Well, no, not to us, either, but what the heck. The cast of this trainwreck is pretty bad all on its own: Arnold Schwarzenegger is the not funny pun-delivering Mr. Freeze, Uma Thurman plays Poison Ivy as if she was inspired by Tim Curry’s Dr. Frank-N-Furter, and both Chris O’ Donnell and Alicia Silverstone instantly date the film as mid- to late 90s. The worst, of course, was George Clooney in his heavily nippled bat-suit. 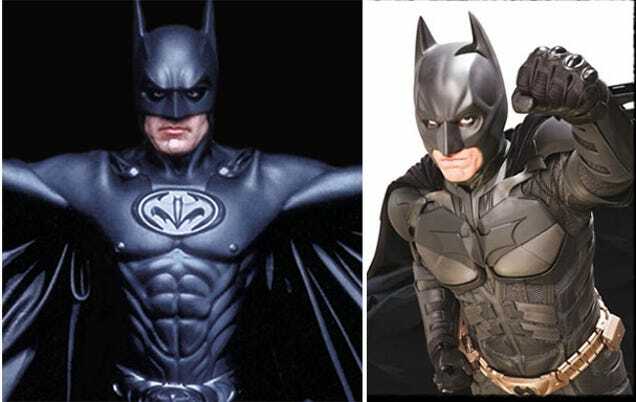 No nips belong on Batman’s suit, ever. Oh, Ben Affleck. Not again. And he went on to wreck Batman this year, too! Oh well. This one was totally ridiculous, and Bullseye, played by a mildly insane Colin Farrell, is worth the price of admission all by himself (as long as the movie is free, of course). That concludes our list of terrible movies we hate to love. Of course you can’t be sure we didn’t leave a few off the list—movies we were just too embarrassed to admit we still watch over and over again. Then again, give what we’ve already admitted to here, it seems pretty obvious that we don’t have anything to hide. Go forth and enjoy the worst of the worst!